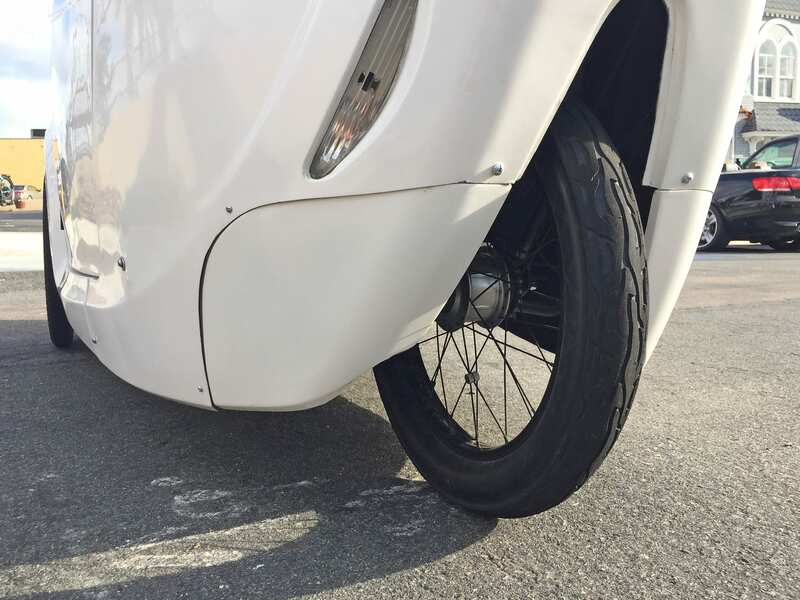 An upright tadpole style velomobile with electric assist from E-Rad, powerful 750 watt motor paired with a 48 volt battery offering five levels of pedal assist and throttle on demand with override! 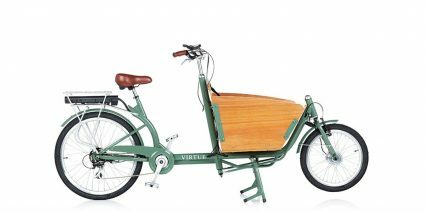 Virtue Cycles produces a range of affordable bicycles with two electrified variants called the Gondoliere Plus and Schoolbus Plus. 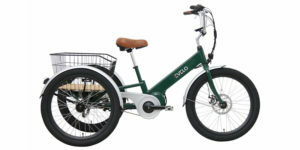 The Pedalist by contrast, only comes with electric power because it’s significantly larger and heavier than the two cargo bikes. This thing weighs in at ~175 lbs without the battery (which adds another 10 lbs or so depending on size). 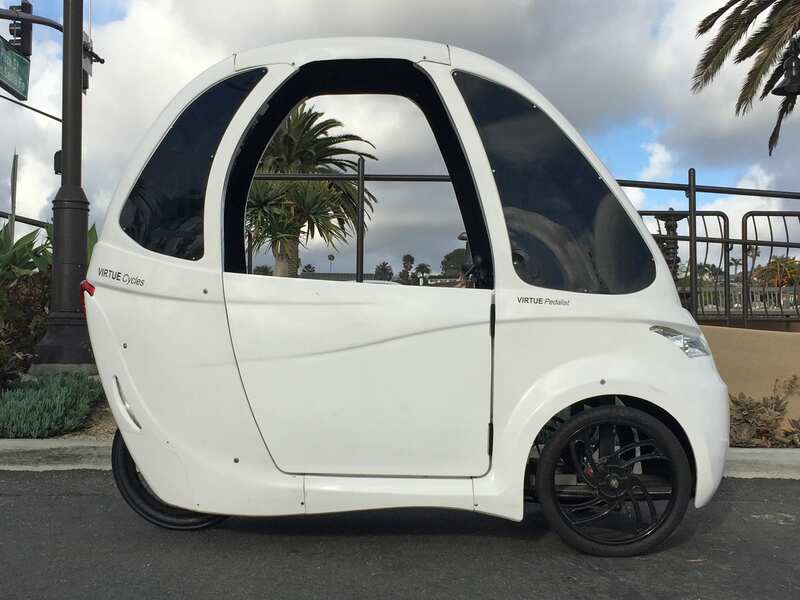 It’s a partially-enclosed velomobile that will keep you shaded and cool in summer months and relatively dry and wind-free in winter months. I say partially enclosed because the side windows are open-air on the stock unit. 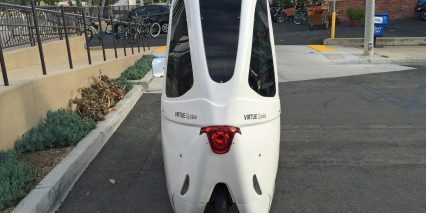 Apparently Virtue Bike can add flexible fold-up roll-up windows for those who’d like additional protection but otherwise these openings improve the flow of sound. 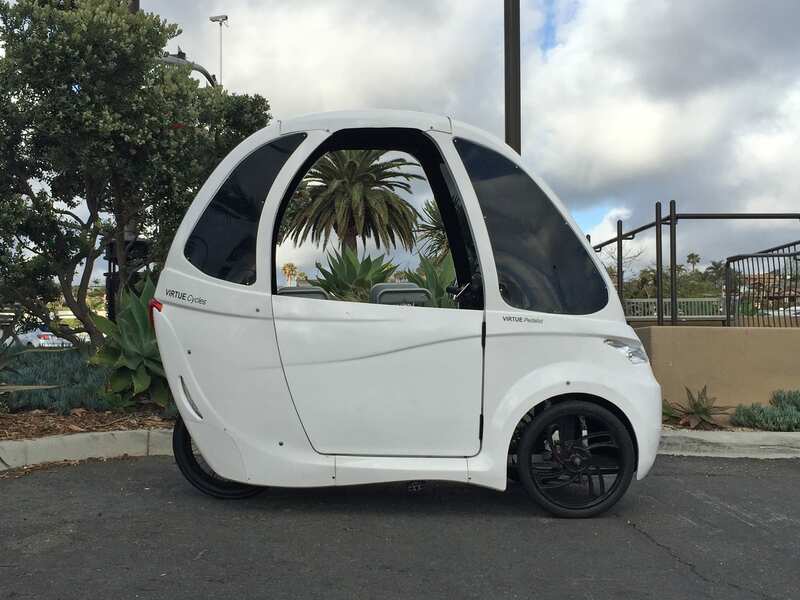 Sound is one of the question mark areas with this and other velomobiles I’ve tested out. 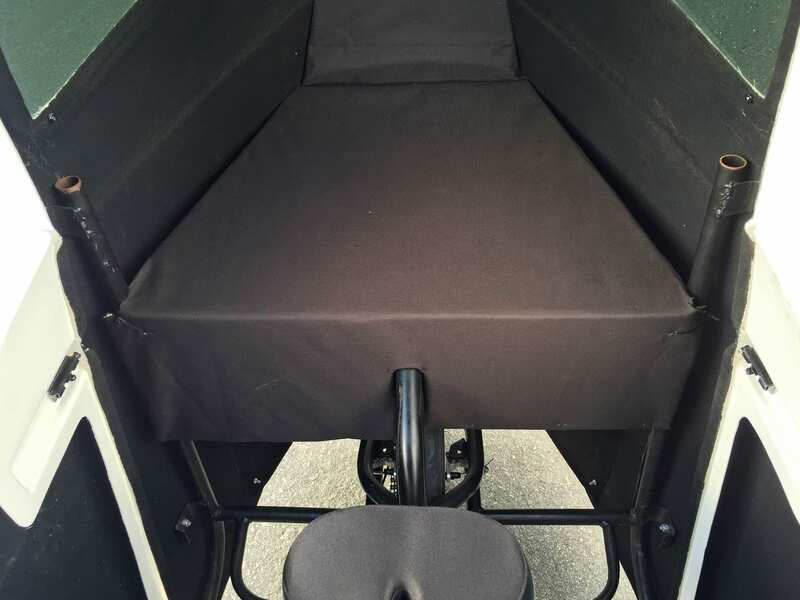 The fiberglass plastic canopy looks great and sounds decent when you’re not riding inside the unit but once you sit down, pedal along and begin riding over bumpy terrain, even large cracks, a booming rattly sound echoes around. You can hear this in the video review above and with comparable products from Organic Transit. 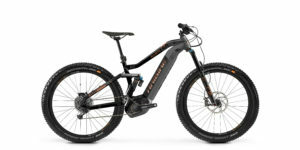 What I love about the Pedalist is really just how affordable it is. 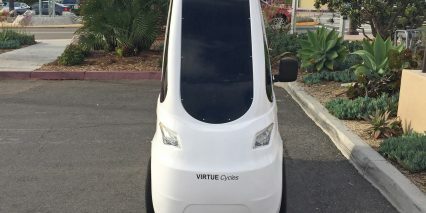 The looks are good, the platform is sturdy (capable of hauling up to 750 lbs including two adult passengers with room up front for cargo or a child seat). 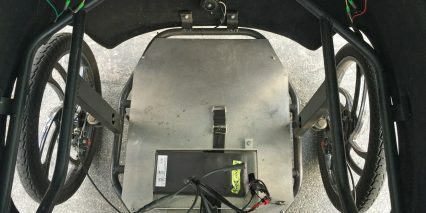 It’s surprisingly powerful, relying on a 750 watt mid-drive motor kit from E-Rad that can peak out around 1,300. 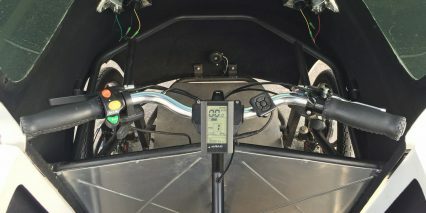 You get pedal assist, throttle mode (that overrides assist) and can setup multiple 48 volt battery packs for extreme long distance riding. 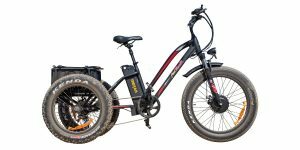 The stock pack now offers 20 amp hours of capacity which is more than double what I would call average on traditional non-enclosed electric bikes. 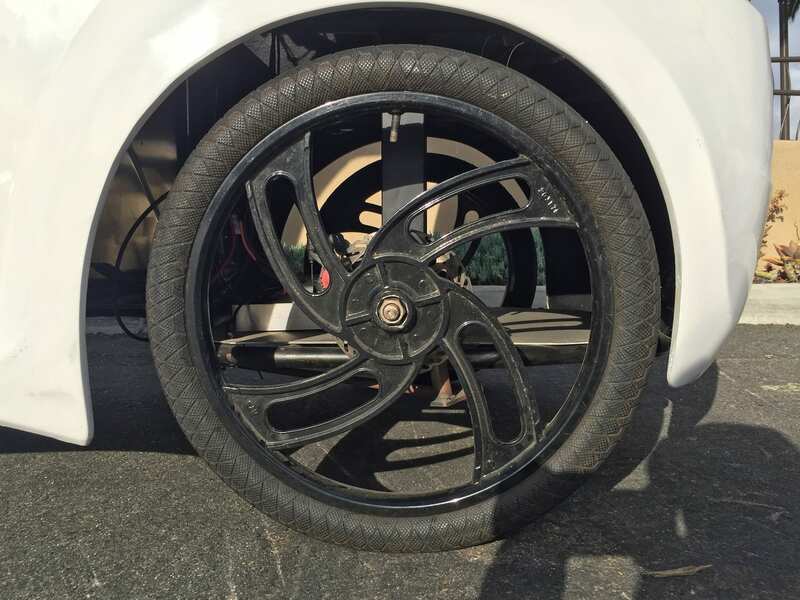 What you don’t get here is suspension… the 20″ wheels are small and sturdy but not as forgiving as something with more “spanning” potential like a 24″ or 26″ wheel. 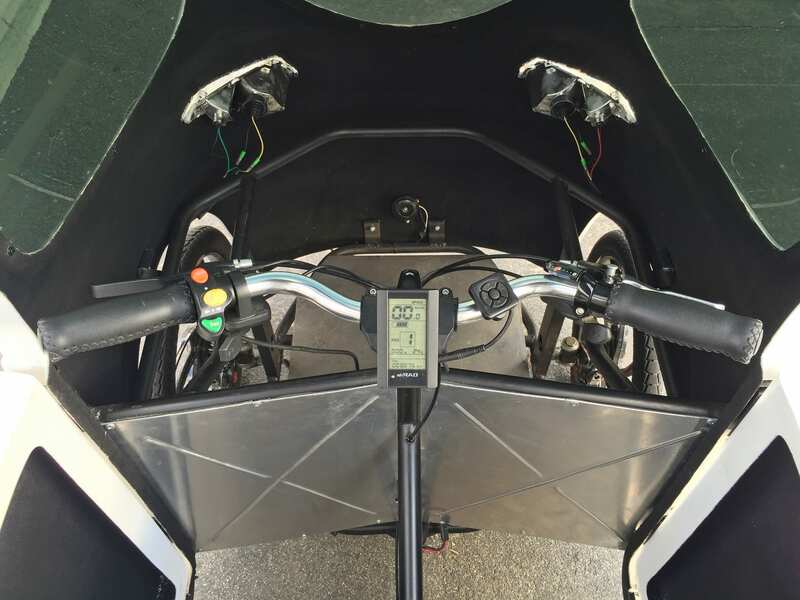 They do keep the overall height of the bike down, making it more stable, and I was impressed with how easy it is to step into and mount. 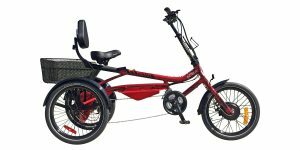 The custom Steel frame is setup as a low-step so you don’t have to lift your leg very high. 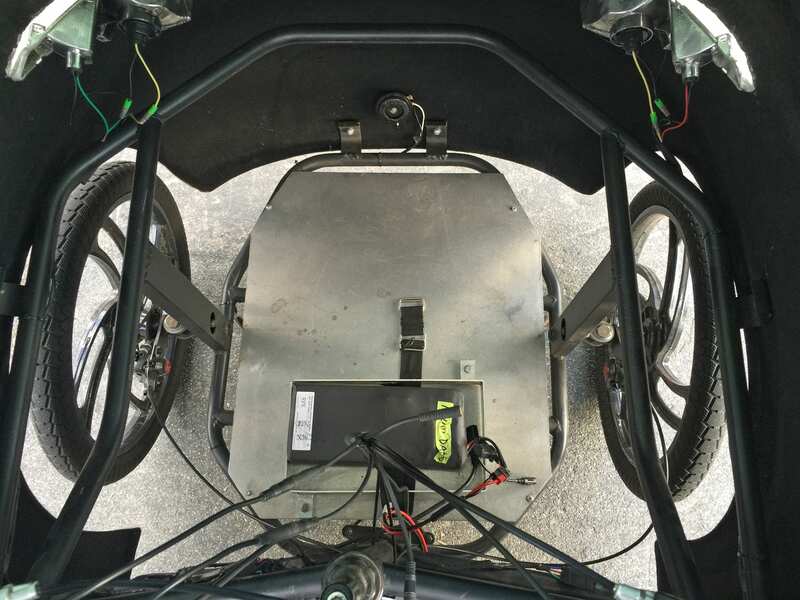 Note that there isn’t a floorboard or any protection where your feet go (as with most recumbent trikes and other velomobiles) so do be careful not to drag your feet or the weight of the bike could injure them. 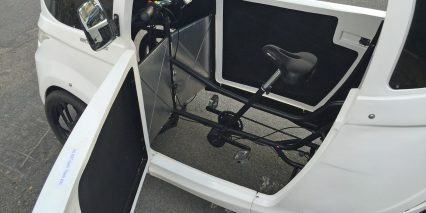 The passenger seat is just behind the driver and the front box area has lots of vertical space to build up a basket or mount accessories. 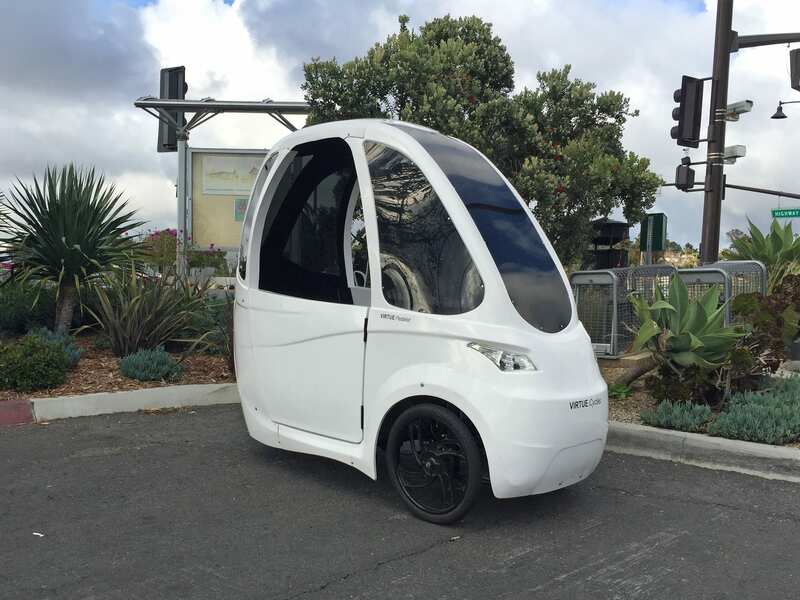 The driver has a nice upright seat with bars that are close and use a mid-rise bar. 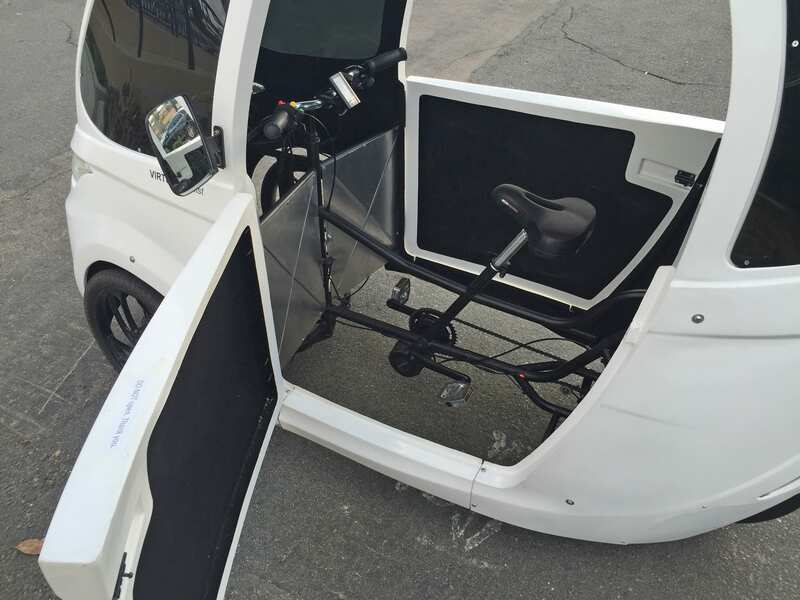 This isn’t a recumbent bike and it doesn’t force you to lean forward, I’d describe the seating position as up, alert and comfortable. 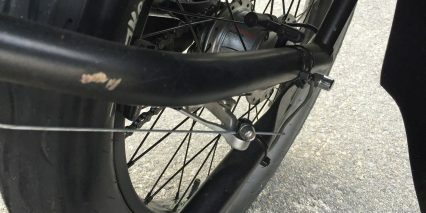 The steel is sturdy but does cut out some of the vibrations and if you really wanted to smooth out the ride you could swap out the standard seat post for a 27.2 mm Thudbuster (some newer models may have 28.4 mm or 28.6 mm). 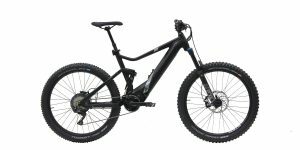 In conclusion, this bike seems incredibly affordable to me. 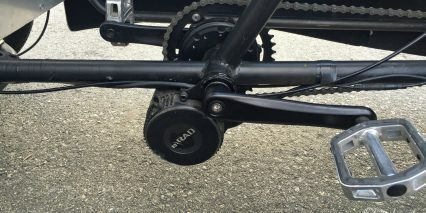 You get a premium drive system from a company I recognize and trust, an quality internally geared hub with eight speeds from Shimano (that let you shift at standtill), a full set of lights including turn signals and the option to coat the inside with a softer noise-absorbing flocking material and choose a custom color. 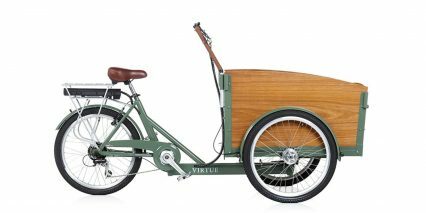 Virtue Cycles is backed up about three months for the Pedalist and each one is a custom build. 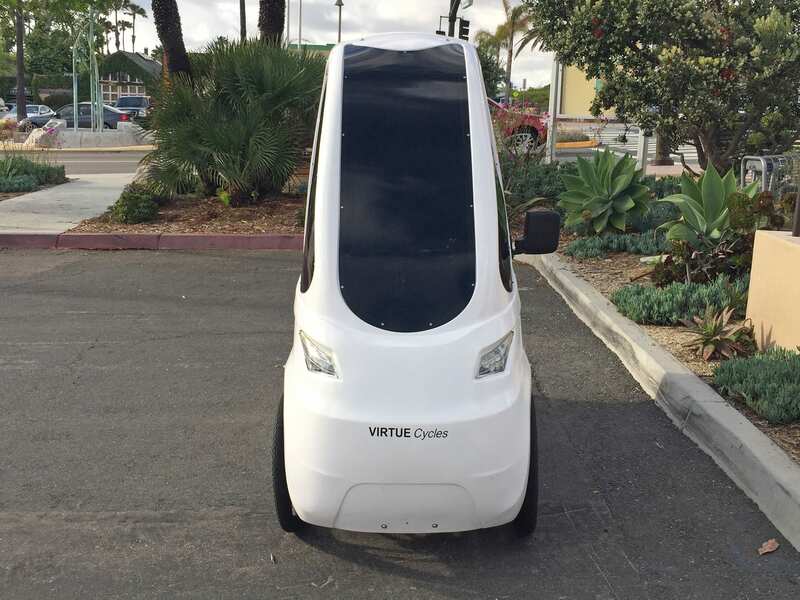 If you live near Southern California they will deliver it but otherwise you’ll have to pay for a shipping company. This thing is stable enough to load and mount easily but narrow enough to fit through standard sized doors. 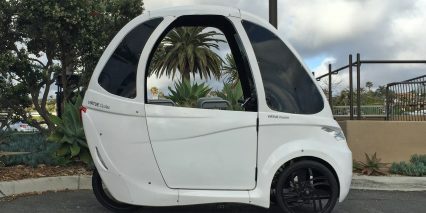 It’s intuitive to pedal and steer, just like a regular city bike, but unique and fun in the way it looks and very capable in how it transports passengers. The rattly noise does bother me a bit but I can’t see a way around that for now? Maybe in the future the body panels will be mounted on rubber bumpers to help dampen it or some thicker coating will be applied inside? 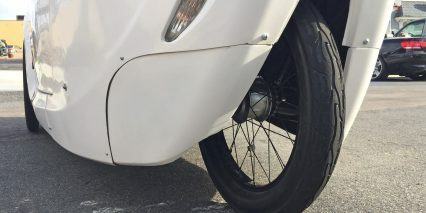 I want to close by calling out the removable rear panels on the outer shell that make changing tires or adjusting the gearing much easier. 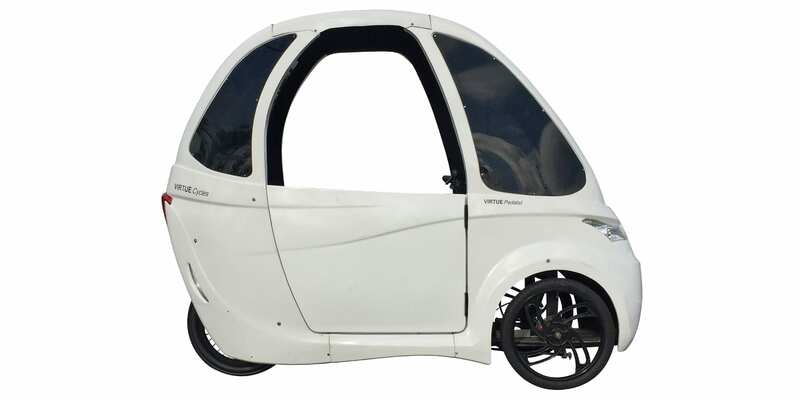 You can even leave one off and use the Pedalist Cycle with a trailer for even more cargo capacity! 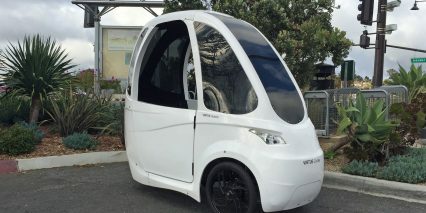 I love the concept and had a blast riding around with the founder William Mulyadi in San Diego near where the company is based. 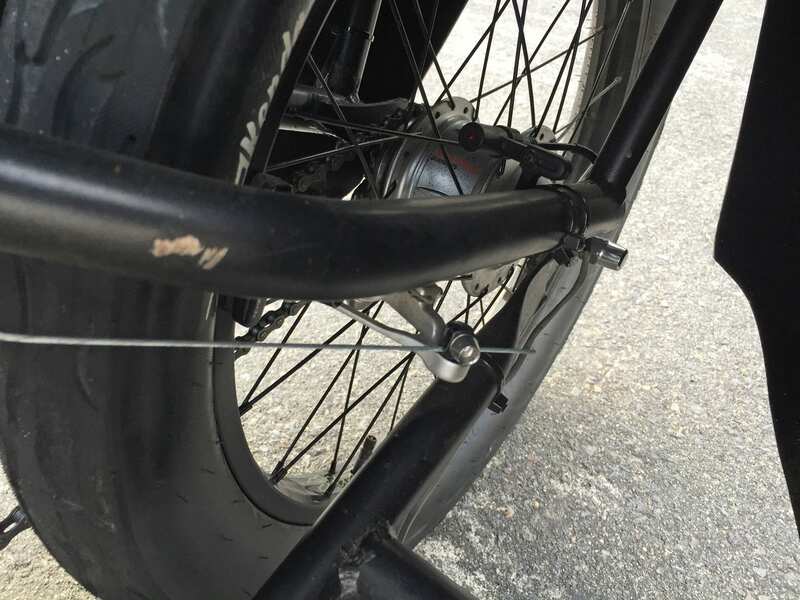 Changing a flat tire on this bike could be difficult… there are no quick release systems and the bike itself is heavy, you might have to set it on some bricks or prop it up somehow, maybe tip it to one side? Be careful! Hi Nirmala! Great to hear from you again, hope you’re well :) yeah, if you were going fast and turned hard I feel like it could indeed tip but it’s not as tippy feeling as it looks. 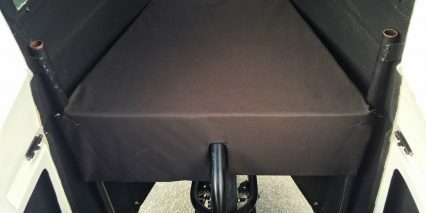 The canopy is relatively light weight and air can indeed pass through. Hopping inside and loading it up with gear feels very solid as does riding around regular streets, even going up some angled driveways in a parallel fashion feels comfortable for me, not quite as much as a recumbent bike like the Organic Transit ELF but being upright feels way more comfortable for me personally, I can lean my body sideways if needed. Would like to see someone take this through a doorway. Looks like the door would need to be taken off of its hinges first. 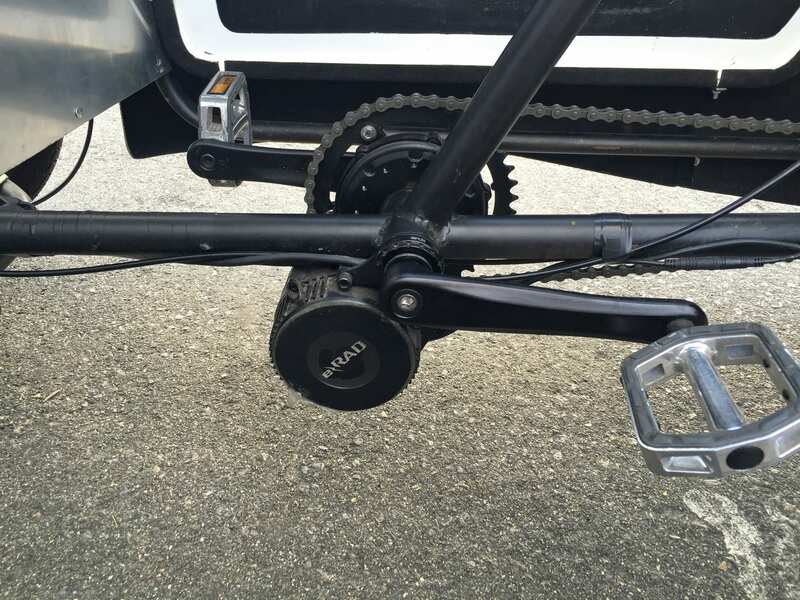 Given the weight and payload capacity, seems that hydraulic brakes would be more prudent. 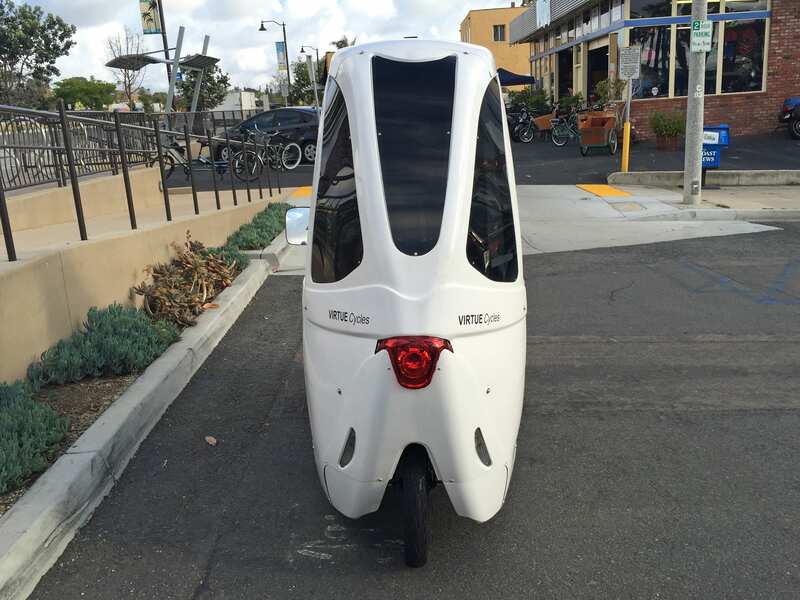 And if I had one, I’d want the rear turn signals flanking the rear window. 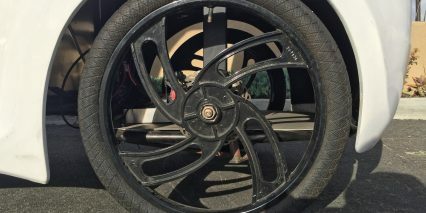 Intriguing design. 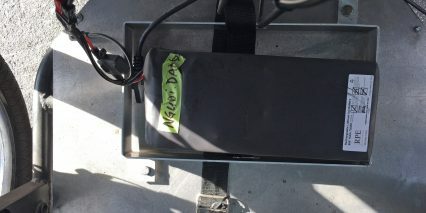 The video says ‘extra batteries can be wired in series’ – that is incorrect. 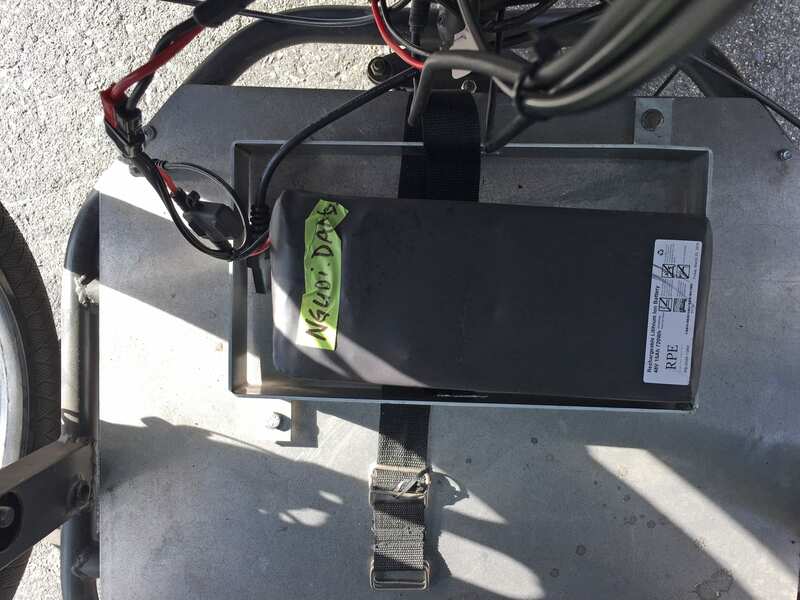 Wiring batteries in series increases the voltage (voltage is additive). What should be done is wire them in parallel such that the voltage is constant and the amp-hr is additive; however, that is still a bad plan for lithium batteries as the packs would not be balanced and could cause cross charging and in the worst case a fire (say one near depleted battery is wired to a full battery). The best is to just have spare batteries and swap when needed. Hi Patrick! I think their thru-put is slow and they do build to order for most orders so it’s a combination of demand and the custom work being performed. 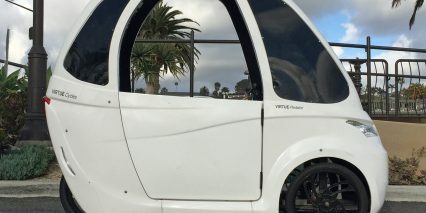 Even though the body is a fiberglass/plastic material that still weighs a lot, especially with the windows… and then the large sturdy steel frame and longer axles and the battery rack up front and passenger seat in the rear! It all adds up to something that’s very capable but also heavier ;) Aluminum might help but I don’t think it’s as strong or cheap as steel so they’d have to reinforce it and lose some of the weight savings while driving up cost.